The Okanagan Falls Winery Association is putting on the Party in the Park event to kick off summer here in OK Falls. Come join us and our neighbouring Okanagan Falls wineries for some slow cooked southern BBQ, live music, and wine samplings from Blue Mountain Winery, Noble Ridge, Stag's Hollow, Painted Rock, Blasted Church, and more! Also, Blue Mountain Winery is giving away 2 tickets to the event. To enter, find your way to our Facebook page, "like" us (please! ), and share the post about the event with your friends. Simple! Tickets can be purchased online via EventBee. 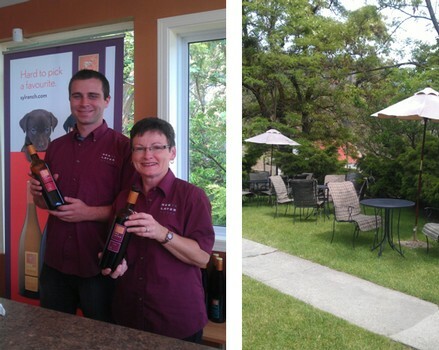 On May 31st we had the opportunity to visit some of our neighbours in the OK Falls Winery Association. This was an opportunity to get to know some of the people in our association and also find out a little bit about each of the wineries and what makes them unique. Our first stop was to see Jeri and Josh at See Ya Later Ranch who were very welcoming and did a great job sharing all the wines SYL is producing. As their new patio is constructed they are encouraging people to enjoy lighter fare out on the grassy lawn in front of the winery for picnics under the shade of the trees. Cheese boards and charcuterie are available on site everyday with featured specials on the weekends. Wine shop hours are 10 am till 5 pm every day. Our second stop of the day was at a new winery in Kaleden that neither of us had visited before. 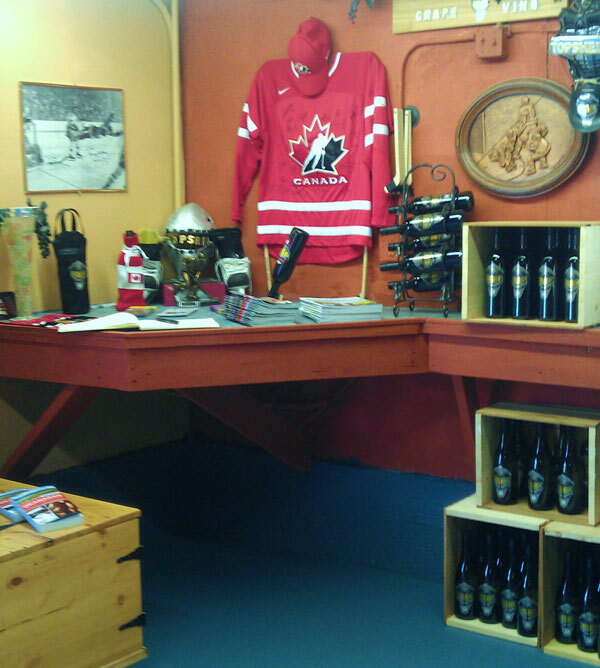 Top Shelf Winery has a hockey theme and the wine shop has a great memorabilia area. 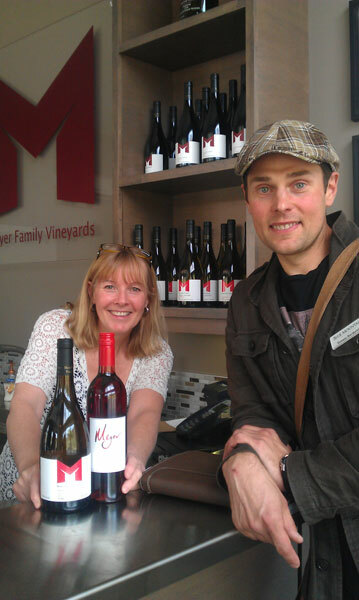 Myra and Len are in their first year of operation and have three wines to try. All of the wines have great hockey theme names like Slap Shot Chardonnay, Point Shot Pinot Gris and Over the Top (OT) Merlot. The tasting included great cheese from Village Cheese in Armstrong to complement the wines. They also sell gelato! On June 30th they will be celebrating their grand opening from 2 – 6pm and invite everyone to visit for some great food and entertainment. 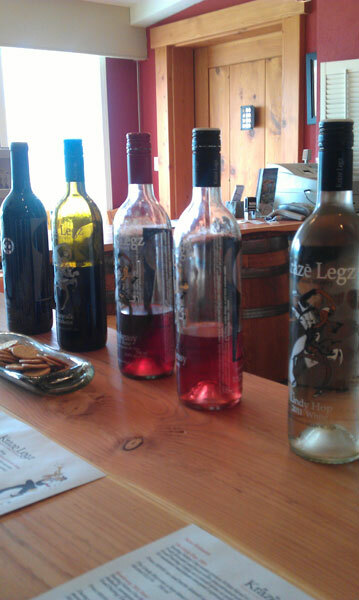 Next door to Topshelf is Kraze Legs Winery, also relatively new. The entire winery is themed around the 1920’s and has a great area to bring your own picnic or purchase an assortment of cheeses and crackers onsite. With stunning views of Skaha Lake from the west side a really unique place to spend a few hours. All of their wines are named after dances from the 20’s like “All that Jazz” and “The Bees Knees”! A quick stop at Bighorn Ridge to meet Carla and see the magnificent view from her Guest House was greeted with a brief rain shower on our arrival but we were dry and comfortable under the shelter of the guest house. 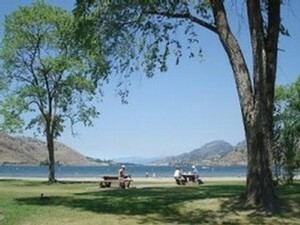 What a peaceful place to stay in the Okanagan. Rustic elegance in wine country. Also pet friendly! On our return Noble Ridge was the next stop. We visited with Katie and Tamsin and sampled some of the wine’s from Noble Ridge including the King’s Ransom. 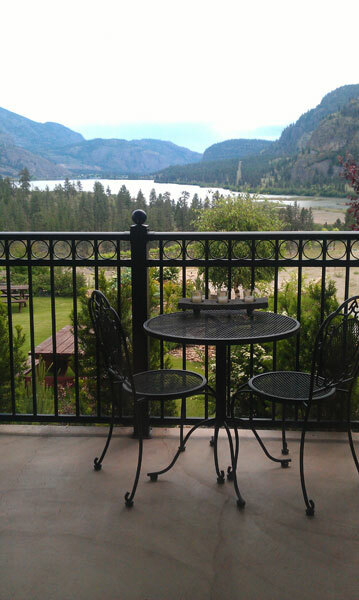 Noble Ridge is open 10 – 5 each day and has a stunning deck to enjoy a picnic. You can bring your own or take a sampling of local cheese and charcuterie available at the winery. They have a great assortment of gift items and are hosting some interesting events in the coming weeks. June 30th is their Calgary Stampede 100th Anniversary celebration Breakfast complete with white Stetsons and great food and entertainment. Stop by before you start touring that day! Our final stop of the day was at Meyer Family Vineyards on Mclean Creek Road where we sampled our way through the majority of their portfolio graciously hosted by Jak, Sharon and Van Dorin. After lots of laughs we were on our way back to Blue Mountain. 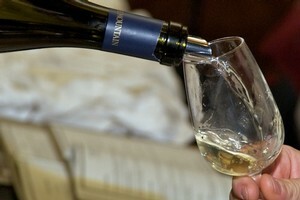 Meyer Family Vineyards also offers private Sommelier led tastings. These are completely customizable and must be booked in advance with the winery. Alas we were unable to visit all off our neighbours due to time constraints but we are hoping to get out to Painted Rock, Blasted Church, Wild Goose and Stag’s Hollow another day. 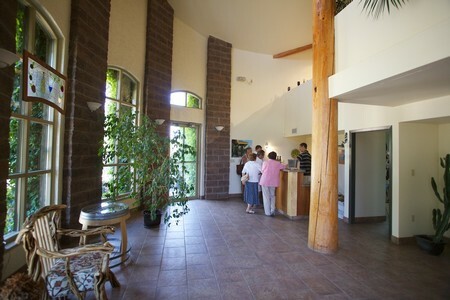 Thanks everyone for making us feel so welcome and we look forward to sending visitors to all the unique wineries in the Ok Falls Winery Association this season. Many of us at the winery are avid cyclists, so we know that the riding here in the Okanagan is spectacular. We have fantastic trails for mountain biking looking out over the vineyards and lakes, and our farm country roads provide a relatively traffic free ride through our stunning wine country. The Axel Merckx Granfondo, hosted by Axel Merckx — professional road cyclist and son of the legendary Eddy Merckx — has quickly become one of the Okanagan's premier cycling events, and actually cruises right by our winery on Oliver Ranch Road. The rolling hill section of the course will take you past us, and some of the other OK Falls wineries like Stag's Hollow Winery, and Noble Ridge Winery, with stunning views of Vaseux Lake and MacIntrye Bluffs in the distance. We're happy to share this amazing scenery with our fellow road riders, and hope everyone has a fantastic ride. Of course, one of the best post-ride ways to celebrate the accomplishment is to spend an extra day in the valley wine tasting, so if you're riding in the Penticton Granfondo, have an excellent ride, and feel free to stop by the winery the next day for a complimentary tasting. We'd love to hear your stories from the road, and we'd be happy to point you in the direction of some other fantastic Okanagan wineries that you may have passed in a hurry the day before on your bike! Happy spinning from the Blue Mountain team! Blue Mountain in the City! Things have been busy in the vineyard this Spring, but our winemaker Matt Mavety, managed to conveniently escape for a couple of days to Vancouver. He refuses to confirm this, but we believe it might have something to do with the lack of sun over the last week. While attending tastings of our latest vintage at a few Vancouver wine dealers, Matt managed to catch up with John Schreiner, who has been an ardent supporter of BC wines, and of Blue Mountain from the beginning. 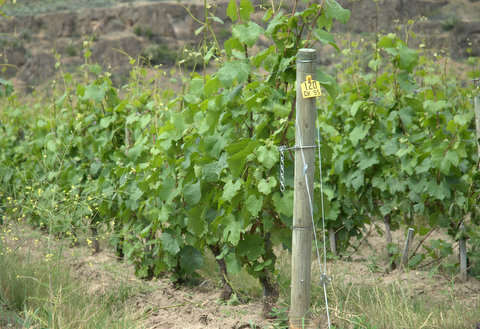 Check out what he penned about Blue Mountain and the Okanagan wine scene over at John Schreiner on Wine. Thank you John for your continued support of Blue Mountain wines, and of the entire BC wine industry!